I was off for a few days and decided to use the time to restock the freezer. I like to keep several ready-to-eat items on hand for packing for lunch or when we get busy and don't eat until we are absolutely starving. Homemade is infinitely better than anything pre-made from the store; it's healthier, tastier, AND cheaper. I also make up dinners to keep in the freezer for long work weeks. Chicken Pot Pie falls into both of these categories. 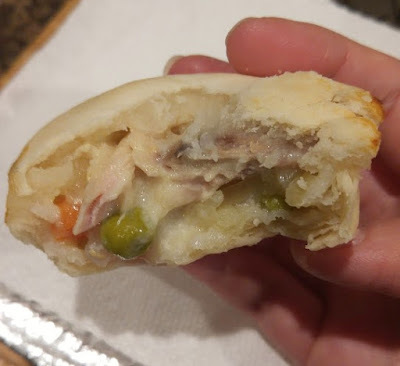 I can make up a whole pie and freeze it for later, or I can make up a bunch of these Mini Pot Pies (pictured above) to keep around for lunches. 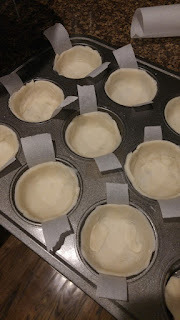 Note: You will need 4 pie crusts (ex: two boxes that make two pie crusts each) when making the 20 mini pot pies. You can alternatively make 10 mini pot pies and 1 slightly less stuffed big pie. If making just the big pot pie, you will need 2 pie crusts. Prepare your pie crust if it isn't pre-made. Boil vegetables for 20 minutes; drain. Stir in the chicken stock, wine, vegetables, and chicken. Season to taste, and simmer for 20 minutes. Meanwhile, if you are making a whole pie, get the crust ready to go in your pie pan. If you are making the mini pot pies, use a large mouth cup that has a larger diameter than your muffin pan to cut out 40 circles. Use 20 circles to press into your muffin pan. I highly suggest using strips of freezer paper to make it easier after baking to pop the mini pies out (refer to the picture on the right). Pour your filling into your pie crusts. For the big pie, I suggest adding all the vegetables first and then the liquid because you will probably have too much liquid. Press your top crust on, cut some slits, and you're ready to bake! Bake at 450F for 10 minutes. *If you want to make your own crust, that's fine, but I personally don't like to mess with it. I buy the Betty Crocker pie crust mix, but you can also buy a pre-made roll-out crust in the refrigerated section by the biscuits and cinnamon rolls.